While many etiquette rules can seem a bit stuffy, there are a few that I try to abide by: Don’t start eating until everyone is served, always send a thank you note for a gift, and never show up empty handed to someone’s house for dinner or a party. This last one is one of my paramount rules. I have often been late to dinner (which isn’t very good etiquette, I know!) because I couldn’t bear to show up without a bottle of wine or some cookies or flowers or something for the host. Well, this holiday season I think I may have found the perfect gift for your holiday hosts and hostesses! 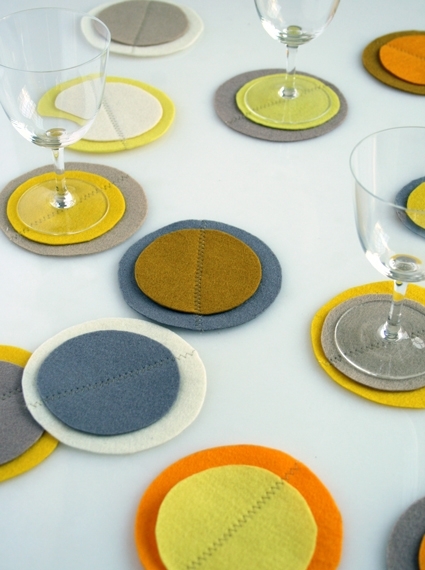 These simple Gold and Silver Felt Coasters take about as much time to make as a trip to the wine store, but unlike a bottle of Syrah, they are imbued with handmade love. 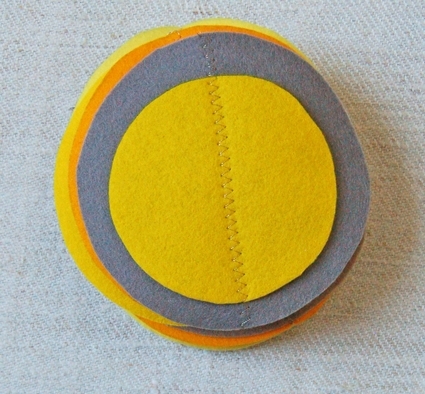 Just piece circles of 100% wool felt together into a chain, and voila, clever coasters that can be cut apart as needed! I used our new New Years Felt Bundle , inspired by the elegant colors of a New Year‘s Eve party, and Sajou’s Metallic Gold Thread, for a beautiful spark of light. 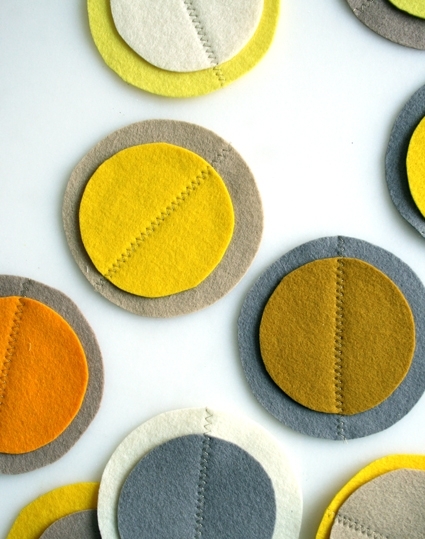 Just one bundle of felt makes 24 coasters which you can divide into two sets of twelve or three sets of eight or however you like. A Gold and Silver Coasters Template, available for free download here, printed and cut out. You’ll also need a pencil. 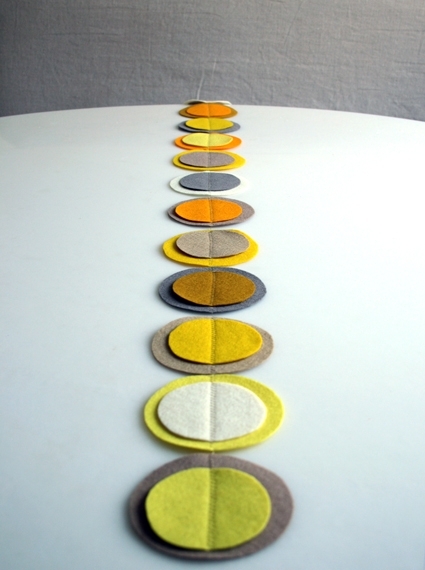 Trace three large circles and three small circles close together on each piece of felt. Cut the circles out. You’ll have 24 large circles and 24 small circles. 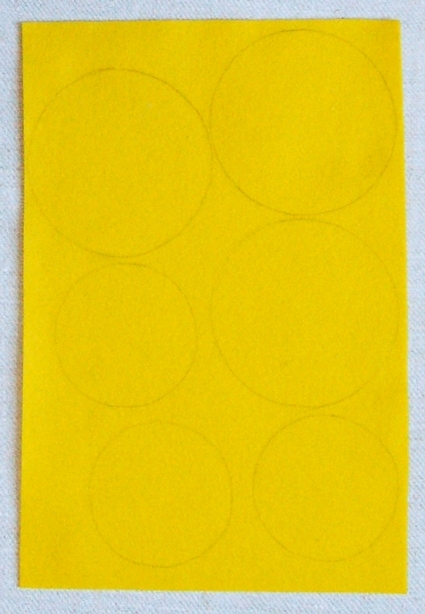 Arrange twelve of the large circles in a pleasing and random order. 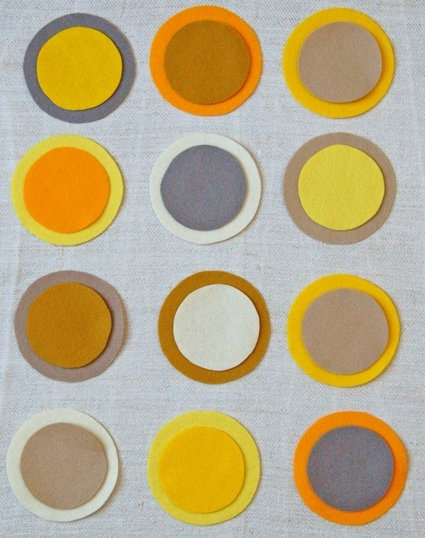 Place the small circles on top of them matching colors you think look good together. 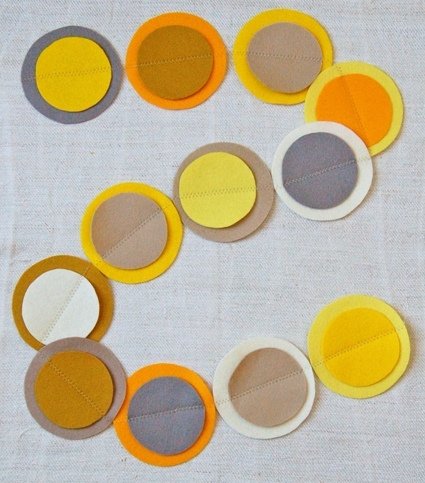 Note: These instructions will make two sets of twelve sewn together coasters but you can make sets as large or small as you want. 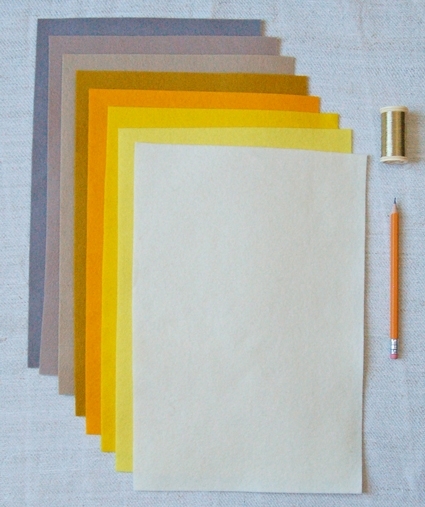 For instance you could make three sets of eight, four sets of six, or six sets of four. Using the metallic thread and a zig zag stitch sew the small circles to the large circles in the order you laid out in the previous step through their centers. Use the seam guide on your machine to keep the large circle centered. 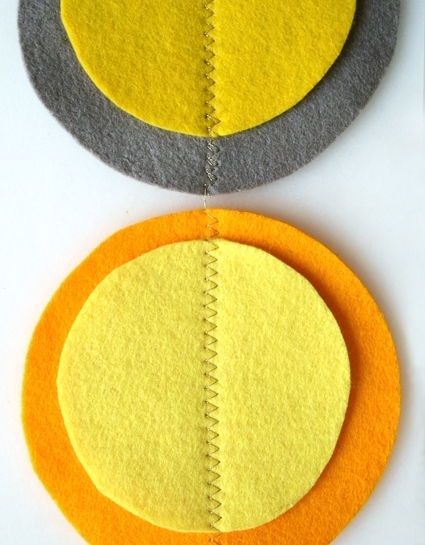 Do not pick up the sewing machine foot or cut the thread between coaster, just sewn them together in a long chain. There is no need to pin the small circles in place, the subtle differences in placement add to their modish cool, I think. 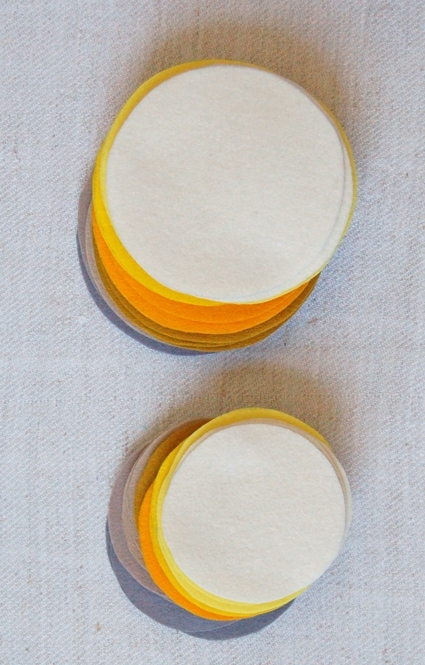 Fold the chain of coasters up like an accordion and it makes a cute little stack, all ready to give. 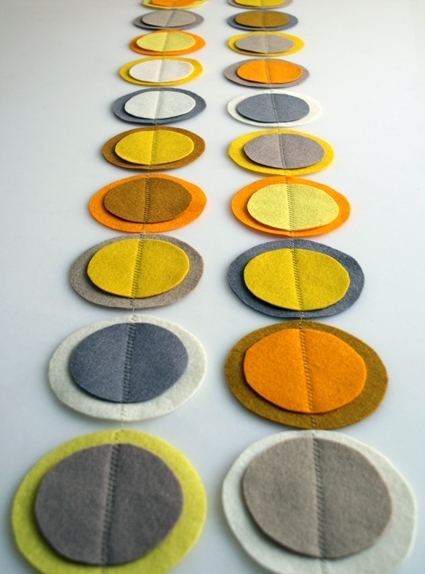 Repeat for remaining felt pieces to make the second set. Last Minute Knitted Gifts Goes Digital! Love these! I have a quick question. Do I need to reverse sewing at each end of a coaster so it doesn't come undone? 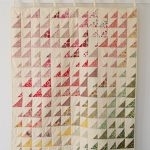 You don't need to backstitch at each end. We find they stay together pretty well without it. 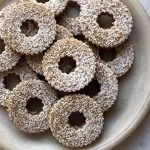 These are great, my brother will love them. They are going in his care package. Just one question, is the felt stiff or is regular flimsy felt? I wouldn't call it flimsy but it is a regular thinner weight, But since it's wool and not acrylic it does have more body than drug store felt. Chain piecing, which is sewing one piece after another like this, is actually very simple and is done primarily to make sewing quicker and easier. 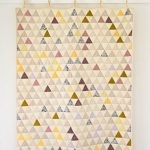 It's used a lot in quilt making, when you have to sew dozens of pieces together. You don't need to sew the next piece immediately after the first, you can let the machine sew into nothing for a few stitches in between. 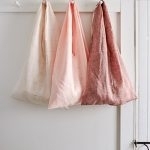 I promise, it makes sewing something like this easier, not harder! I hope this helps. Please let us know if you have any more questions.